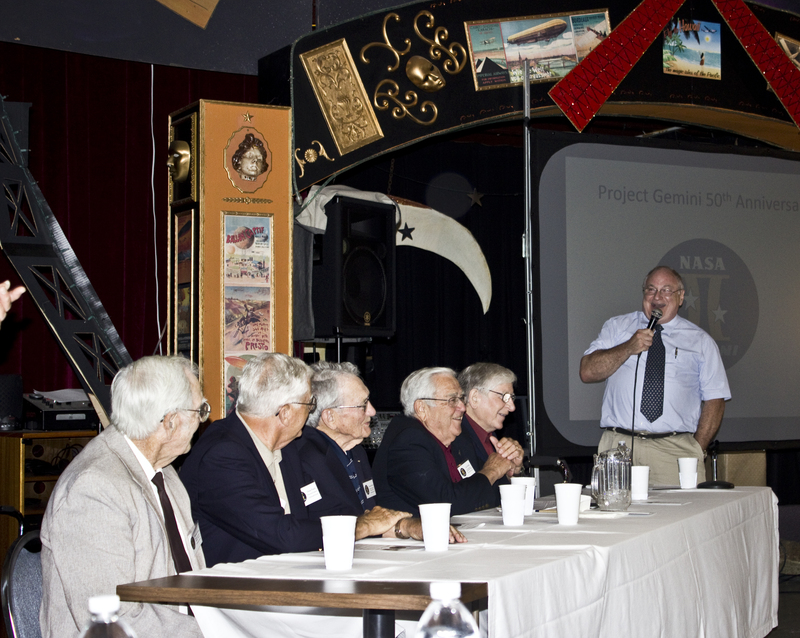 The Missouri Aviation Historical Society was thrilled to formally hold a fiftieth anniversary celebration of the McDonnell Aircraft Corporation’s Project Gemini program on Thursday, June 18th. Designed and built in St. Louis, Missouri, project Gemini became one of the most important aspects of the NASA space program. Held as a direct sequel to our Project Mercury celebration in 2013, former engineers and communication experts re-joined together for a live Q&A panel that included pre-selected and audience chosen questions and stories. An audience of 60+ guests were treated to frank accounts of the challenges of space travel, humorous commentary, and exclusive insight into world famous aviation heroes such as Gus Grissom and James S. McDonnell. Norman Beckel- Electronics engineer, charged with testing the communications system. During lift-off he would hold his breath when the launch would reach the point of no turning back. Dean Purdy– An electrical engineer who worked on multiple fighter jets, missile programs and eight space programs. Purdy worked with the original seven astronauts and heavily influenced the designs on Gemini. Earl Robb– Structural and mechanical design engineer who worked on the heat shields and hatches for Project’s Mercury, Gemini, and SkyLab. Jerry Roberts– Engineer who worked on several McDonnell programs in the fields of guidance and control systems. He retired as Chief Design Engineer for the company. Ray Tucker– An electrical ground support engineer who helped establish a complex cabling system for project Mercury. He would be present for EVERY launch of both Mercury and Gemini. Earl Mullins from the Bonne Terre Space Museum acted as moderator and kept things moving swiftly with talk about the impact and history of Gemini. In addition, Project Gemini patches and thrusters were provided for display by the Greater St. Louis Air and Space Museum. A reception sponsored by McArthur’s Bakery immediately followed with an extravagant Gemini themed cake. As a final token of appreciation, MOAVHIST President Dan O’Hara presented all five panelists with copies of the new book ‘NASA Gemini- Owner’s Workshop Manual’, by David Woods & David M. Harlan, just in case another capsule was needed to be built! The society would like to formally thank our panelists, moderator and volunteers for making this event possible. As always special thanks to Creve Coeur Airport for providing our meeting space and refreshments. SPECIAL THANKS to McArthur’s Bakery and Haynes Publishing for the wonderful books. Additional coverage can be found via our friends at the Aero Experience. February Meeting: Boeing’s 100th Anniversary! I wish I could be there for the event at Creve Couer airport. I was involved in both the Mercury and Gemini test programs. I tested the Mercury ECS system and the Mercury explosive hatch system, as well a many other components. I had lunch with Wally Schirra when he was here tesing the Mercury Environmental Control System. I was on the altitude chamber rescue team for astronauts testing Gemini 3, 4 and 5 in the 14-foot altitude simulation chamber. I was in charge of the altitude chamber rescue teams for Gemini 6 through 12. I was in meetings with both the first man to walk on the moon (Neil Armstrong) and the last man to walk on the moon (Gene Cernan). I wish Rose Church could be there. She died about 2 years ago. She was the aerospace nurse who installed the bimedical sensors on the astronauts as they suited up for testing in the space chambers. She knew the astronauts well. She had some great stories to tell. Gordon Cooper gave her his Mercury space-suit (a spare I am sure) that she used for years in giving lectures about her experiences. If any from McDonnell laboratories are there they will remember my name. The reason I can’t be there that day is that I am still working full time for Boeing. In fact, on that very day, June 18th they are celebrating my 55 years of service to the company in the McDonnell/Boeing Prologue Room. Congratulations on your 55+ years at Boeing! It’s always a pleasure meeting people who were apart of history, and thank you for sharing your story. Our president Dan O’Hara has contacted you directly as well. Hope to talk soon. Wish you would also read Blue Gemini (novel- based on the real program) – and check out the images of the Gemini spacecraft the AF used with skids! Thank you for the awesome recommendation Peter! Our president Dan O’Hara is contacting you directly for more information about it. I worked on the Blue Gemini, the Air Force version that was in association with the MOL. I do not think that the Air Force version used the landing skids. The landing skids were part of the original Gemini program. They were abandonded when they determined that the Rogallo wing they planned for it was not adequately controllable. John McDonnell was the structures engineer responsible for the design of that landing gear. I have pictures to the testing of the dual gas environmental system for the Gemini and have a picture of the mockup Gemini landing skid. I could not find a way to attach them to this reply. By the way, there were two reasons that ejection seats were chosen for Gemini instead of the escape tower that was used on Mercury and Apollo. The Mercury and Apollo launch vehicles were oxygen, kerosene vehicles which could produce a detonation that could crush the spacecrft. The fuel of the Titan 2 was hypergolic. It only produced a flame. The ejection seats could eject through the flame and were also more compatible with the Rogallo wing landing configuration that was later abandoned. Ask John McDonnell. He can tell you the story behind those decisions. I don’t think they went back to the landing skid configuration for the Blue Gemini.